SIGN UP today for the types of alerts and notifications that you would like to receive. Lane County land-based telephone lines are signed up for alerts automatically, but if you use a cell or VoIP phone, you must sign up to receive fire, police and other emergency response agencies to issue emergency alerts to warn citizens of events such as severe weather, fire, flooding, hazardous materials, need for immediate evacuation, civil danger, local area emergencies, and missing persons. Join other community members active in local, disaster preparedness efforts to plan a fun way to help our neighbors, family or friends be more resilient in the face of disasters and emergencies. Bring your ideas for working together across neighborhood boundaries and sharing resources for shared resiliency efforts. Come at 6:30pm to join in the potluck. This is a family friendly event. Bring your own cutlery and plates to make cleanup easy. If you would like to know how to make your home, street and neighborhood more green, resilient and prepared, you will want to know about the G and R Neighborhood Initiative. The Green and Resilient Neighborhood Initiative is a series of presentations, site tours, skill share and work parties. Its all free and takes place in the River Road Neighborhood this summer. Presentations will touch on earthquakes with overviews of CERT Training, Map Your Neighborhood, Neighborhood Watch and creating Green and Resilient Neighborhoods. The presentations will explain how these programs can help neighbors meet and work together. The site tours will feature edible landscaping, rain water catchment, solar design, front yard gardens, examples of neighborhood collaboration and much more. The skill shares will include food storage, permaculture, edible landscaping and more. The first presentation is June 13, 7 PM at the River Road Rec Center, 1400 Lake Drive. Josh Bruce, Director of the Oregon Partnership for Disaster Resilience will explain the implications of the overdue Cascadia Earthquake. “Victims” wanted for Community Emergency Response Training Drill. You don’t have to be a CERT – anyone 14 and older can be a victim! High school kids can receive credit for volunteer hours. If you don’t particularly want to lie on the ground, that is not a problem! Victims may be found standing, walking, sitting in chairs, etc. We can accommodate you! Please share this with anyone you think might enjoy being a part of the disaster drill. It’s a fun way to get to know a little bit more about the program and to be able to participate in helping our community be better prepared to respond to and recover from disaster. The presentations will be the third Monday of the month at the River Road Annex, 1055 River Road, a block north of Goodwill on March 21, April 18, May 16, June 20. You are invited to attend a four part series of presentations and site tour – “Creating Green and Resilient Homes, Neighborhoods, Economy and Culture.” The presentations will be the third Monday of the month at the River Road Annex, 1055 River Road, a block north of Goodwill on March 21, April 18, May 16, June 20. Jan has been an advocate of economic and culture transformation for years. The presentations will be a product of sixteen years transforming his own suburban property, ten years on the board of his neighborhood association, a Permaculture design course, organizing many events, speaking tours, travel and taking the time to assess the human condition. The Red Cross is organizing First Aid Service Teams (FAST) to provide basic first aid support for attendees at this summer’s Olympic Trials hosted here in Eugene from July 1-10. This is a great opportunity for high school and college students and community members to be Red Cross CPR/First Aid/AED trained and who want to do something interesting in their local community this summer. Contact Whitney at the Red Cross office, 541-344-5244, if you have any questions. A great class for all of our neighbors. 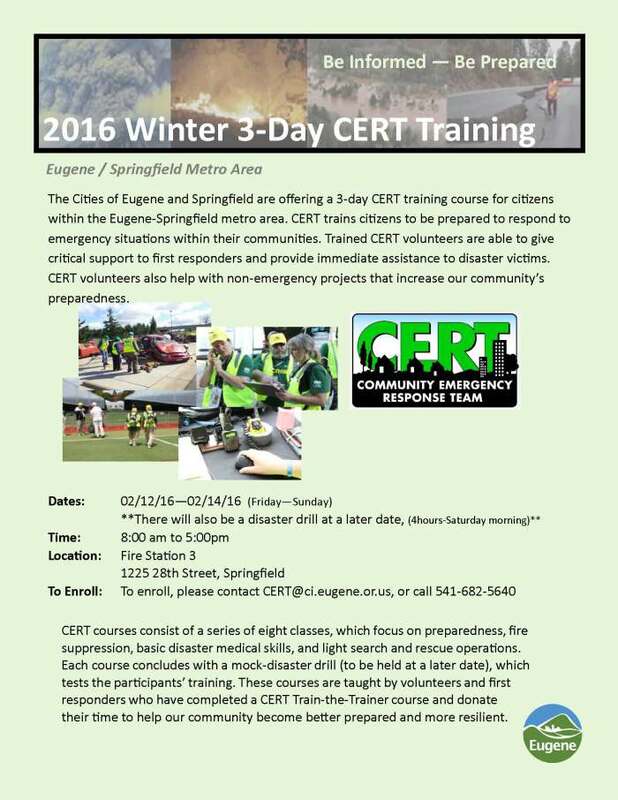 The Winter Community Emergency Response Team (CERT) class is now open for enrollment. If you are a CERT, and have interested family members or friends, please share this information with them. If you are not a CERT, but would like to be, then this is for you! The winter class will be a THREE day class at Fire Station 3 in Springfield, from 8:00 a.m. – 5:00 p.m. each day, February 12th – 14th (Friday – Sunday). The culminating drill day will be held in conjunction with the drill day from the spring class at the end of April. Seating is limited, so if you are interested, please contact devonne.x.maxey@ci.eugene.or.us to RSVP or call 541-682-5640. Thank you for your interest in, and commitment to, preparedness in our community!